I hadn't seen your article on ball lightning but the idea did cross my mind. It was also suggested by Bob Johnson in an Electric Universe conference. Current free double layers were somewhat responsible, if I recall correctly, for a possible dissipative system in our sun. Electro wrote: I hadn't seen your article on ball lightning but the idea did cross my mind. It was also suggested by Bob Johnson in an Electric Universe conference. Current free double layers were somewhat responsible, if I recall correctly, for a possible dissipative system in our sun. I read this a couple year ago. The problem with electrical models is that they never address the conservation of energy or the conservation of mass. Without addressing those two extremely fundamental principles of physics then I don't really see them having any explanatory power, especially when stars are observed to have lost mass and energy as they evolve. What use is a model if it doesn't explain what will happen to the object? I've tried to tell even mainstreamers that but it goes right over their heads. I have considered the idea of ball lightning (or plasmoid) for quite a while. However, ball lightning on Earth only lasts a few seconds and is not showing the slightest evidence of being something that can be maintained for long. Of course, a star is much larger, and in a vacuum, which might make a difference, but we simply don't know that. 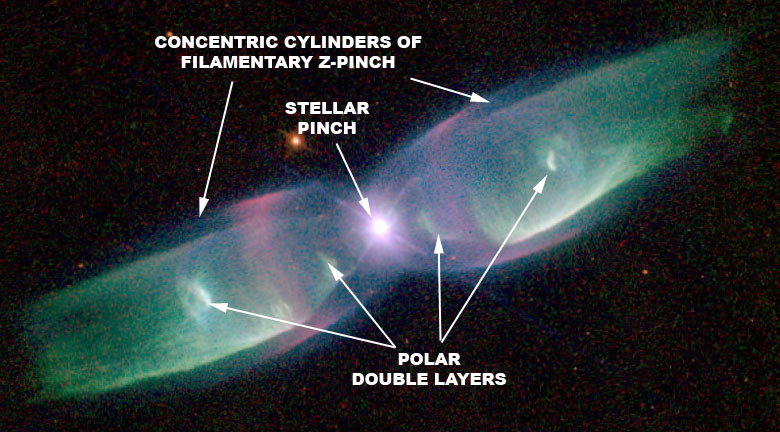 Stars seem to be forming from z-pinches. Bob Johnson talks about kinks... The mechanism for ball lightning seems different from pairs of Birkland currents pinching. The structure in my picture seems like a long-lived process, not something that occurs only when there is charge separation. Last edited by Electro on Mon Jan 08, 2018 1:29 pm, edited 1 time in total. Electro wrote: I have considered the idea of ball lightning (or plasmoid) for quite a while. However, ball lightning on Earth only lasts a few seconds and is not showing the slightest evidence of being something that can be maintained for long. Of course, a star is much larger, and in a vacuum, which might make a difference, but we simply don't know that. Stars seem to be forming from z-pinches. Bob Johnson talks about kinks... The mechanism for ball lightning seems different from pairs of Birkland currents pinching. The structure in my picture seems like a long-lived process, not something that occurs only when there is charge separation. Since stars are also dissipative strutures https://en.wikipedia.org/wiki/Dissipative_system, they operate far from thermodynamic equilibrium, then the rate at which they radiate their heat will diminish because that heat isn't continually added from any external source. I agree with most of what you're saying. But still, there are filamentary structures everywhere In galaxies when we look for them. We tend to see stars aligning on the filaments like what is referred to as beads on a string. To me, that's enough evidence for links between celestial objects. And since those filaments aren't dissipating rapidely, like lightning would, seems to me that there's a pretty good chance there's power keeping those stars in arc mode. And, as long as the current density and voltage are stable, which might be for millions of years, who knows, stars might not change or "evolve" much, as they would be in thermodynamic equilibrium. BUT, as soon as that current is either reduced or killed, then the stars could undergo their slow cooling phase (evolution toward planet formation). As long as the current is stable, stars might simply act as capacitors or transistors in a stable arc mode. We don't see the current coming into our sun, but it probably is in dark mode, with a low density and voltage to keep the sun stable. The tremendous heat and matter coming out of the sun must be compensated somehow. If there is no nuclear reactor at the core, there has to be another source of matter and energy. I don't believe any other mechanism could sustain a star for millions or billions of years. A dissipative system needs input from its environment. It's an exchange. But what exactly is compensating the sun with what it's losing? Of course, for a star to be cooling and evolving, it has to be losing more than it's acquiring, but still, it would be cooling down much faster than what you are proposing, being in the cold vacuum of space. Anyway, it's my opinion. I still haven't really grasped the exact mechanism at play in dissipative structures. I need to read more on them. JeffreyW wrote: Okay, that is fine. A plasma accelerated by an electrical field. Though I am wondering, if the Sun is electrically powered, then why are all the charged particles moving out of the Sun and not towards it? This is very important because it means that via the conservation of mass, if something loses mass, then it becomes less massive. Since the charged particles are not replenished, they are all moving away from the Sun, not towards it, then it means the Sun is becoming less massive, which is predicted by GTSM. The Sun is now a G2V star. It will become a G3V and then a G4V for its next stages of evolution. This is impossible in EU, because they do not have stars evolving. There is also energy in (ie charge moving into the sun, these are photons), all matter recycles charge, in at the poles and mostly out at the equator (Miles Mathis/charge recycling). The charge out takes with it ions and electrons, charge photons is also the same as heat, so heat out means cooling, in the future we might be able to figure out that in total star like bodies lose more heat (charge photons) than they receive over time, you would have a net heat loss. You already have a mass loss with the solar discharge, there is also other particles that come into to the sun like cosmic rays (this was discussed in another thread recently), but i think in all less comes in than goes out, supporting a shrinking/cooling model like GTSM. Electro wrote: I agree with most of what you're saying. But still, there are filamentary structures everywhere In galaxies when we look for them. We tend to see stars aligning on the filaments like what is referred to as beads on a string. To me, that's enough evidence for links between celestial objects. And since those filaments aren't dissipating rapidely, like lightning would, seems to me that there's a pretty good chance there's power keeping those stars in arc mode. And, as long as the current density and voltage are stable, which might be for millions of years, who knows, stars might not change or "evolve" much, as they would be in thermodynamic equilibrium. BUT, as soon as that current is either reduced or killed, then the stars could undergo their slow cooling phase (evolution toward planet formation). As long as the current is stable, stars might simply act as capacitors or transistors in a stable arc mode. A dissipative system does not need constant input from its environment, that's why it is called "dissipative". It is just a system that transforms the energy of one phenomenon to another. Like a hurricane removing the energy of ocean water, or me and pizza. With stars they are the dissipative structures that form as a result of an incredibly violent active galactic nuclei. 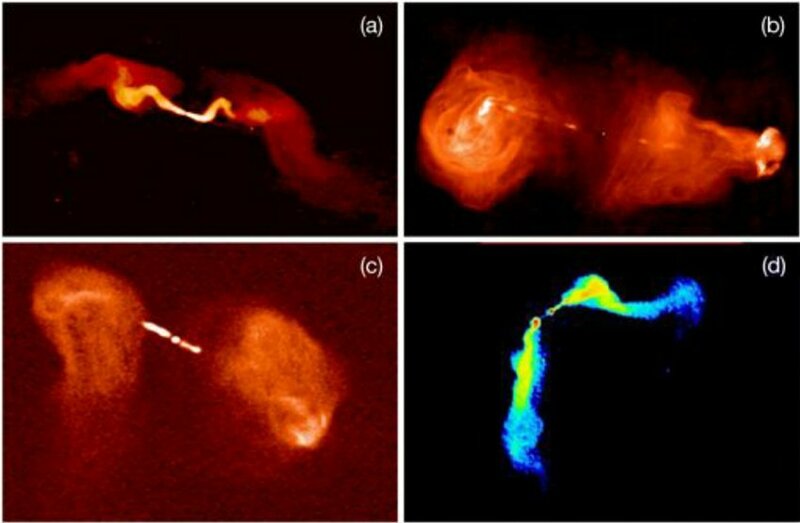 AGN's are the initial events which allow for hundreds of billions of stars to form. EU doesn't mention AGN and their extreme importance in star birth. Birthing galaxies make stars by the billions. We know this because billions of stars are found in single galaxies, just like trees produce leaves. We have also found them by the thousands, they are observed in radio frequencies emitting vast jets and lobes of matter, the actual locations for fusion reactions as well. These objects are tens of thousands of light years in diameter, they are no joke, the most violent things observed in the universe. In those large clouds of material hundreds of billions of young hot stars are forming. The stars are dissipating the energy of the galaxy. Edit: Remember, birthing galaxies were never theorized when the fusion model was invented. In fact, Victor Ambarsumian had hypothesized that matter comes from the centers of galaxies back at the 1957 Solvay Conference, but was ridiculed and all the other visiting astronomers were embarrassed by Victor. Yet, he was 100% correct in that matter comes from the centers of galaxies. Still, in 2018, 61 years later, scientists still teach the big bang nonsense. It is wild. Big bang really ruined the star sciences, bad. So did general relativity and the nonsense of quantum tunnelling (which was patchwork designed to keep the fusion model of stars). Actually, EU does mention this. They have currents entering by the spiral arms and going through the very energetic galactic center "plasmoid", lighting up the stars in their path. And I agree with that too. That's not the problem for me. Stars do cool down over time, it's inevitable. If GTSM agrees that star birth is an electrical process, through z-pinch, it shouldn't be against the idea of an external power source. In plasma cosmology, we do witness such evidence with very clear images of the process. In the following picture, this is not star birth. It's a star being powered. There is a z-pinch, but it may have formed thousands or millions of years ago. It clearly shows that a z-pinch occured within plasma streams, but that it's an ongoing process with current passing through. It's not a perpetual motion machine. Just like on Earth, if you cut the power, it dies. Stars may be big, and plasma does have a tendency to sustain itself, but I just cannot believe that it would be able to do so for billions of years, no matter the size. Mainstrean scientists had to come up with the nuclear fusion model. And frankly, I don't think our sun has lost heat and matter in the past 50 000 years for "intelligent" humans to notice. That time span surely isn't negligeable for a structure without a power supply. We know that the sun goes through cycles though. I don't remember seeing this mentioned in GTSM. But don't get me wrong guys. I do fully agree with GTSM, but mainly after the power source has either died or diminished. Only then can the real evolution take place. Plasma cosmology, and/or EU WITHOUT the mythological/catastrophism and holliow planet crap, give us a real picture of the Universe, showing that the Big Bang/Einsteinian gravity model is not the answer. That gravity is a very weak force, one of many electrical manifestations. I will not make more comments on this subject, since you do not seem to agree the slightest bit with me, but I will say this again. GTSM, unified with Plasma Cosmology, would make a hell of a complete cosmology! A dissipative system is a thermodynamically open system which is operating out of, and often far from, thermodynamic equilibrium in an environment with which it exchanges energy and matter. It's the whole idea of a process, at least as it should be in GTSM to be realistic, which can sustain itself for such a long period of time. The input is not necessarily equal to the output, but nonetheless must be present. Otherwise, forget about billions of years. It'll never happen. A dissipative system is a thermodynamically open system which is operating out of, and often far from, thermodynamic equilibrium in an environment with which it exchanges energy and matter. A dissipative structure is a dissipative system that has a dynamical régime that is in some sense in a reproducible steady state. EU universe is a steady state universe and energy in it is passed downwards (like a step down transformer) from large structure to smaller structures. Trees also use energy to grow, their growth follows the electrical field, electrical field is made up of charge photons, everything is connected. there is no power source needed after the initial energy is provided. It becomes stand alone after it is born. The whole "power source" argument is based on the idea that since something is hot then something is powering it, and is based on our size perspective. I know it might be difficult to explain but I'll try. Imagine the lifetime of ball lightning. It is small and they are events that only take a couple seconds if a single second to transpire. If you were to shoot a slow motion video of it, you could stretch out its lifetime to ~9 hours given a frame rate of say, 1 million frames a second played back at 30 fps. Naturally, it would appear if watched at 1 million frames a second to show to be "powered" by something. But that is an illusion. It is our time perspective which gives it the idea of either being shot out from a cloud and not being powered by anything, to if we slow down the video immensely it will appear to be stable and "powered" by something external, but that is time. Same with stars. They are so incredibly massive, that they appear to need to be "powered". We're essentially watching ball lightning in extreme slow motion. The time variable is no joke. It is just the Sun and all stars are so large, that they appear to be need to be "powered", but they are actually just blimps when you speed things up, as compared to the universe. Deep time and immense size are variables with stars. I think that is an issue with EU. They neglect the fact that 10,000 years is not 100,000 years, is not 1 million, so on and so forth. We're dealing with deep time. I see that you do not agree with the EU concept. Mainstream does not recognize currents in space. But, the same mainstream sees stars as nuclear furnaces, and gravity (with dark matter) as the main driving force of the Universe. So, in my opinion, my guess, or your guess, is as good as their's. And, your dissipative star model, is no less speculative than the EU model.